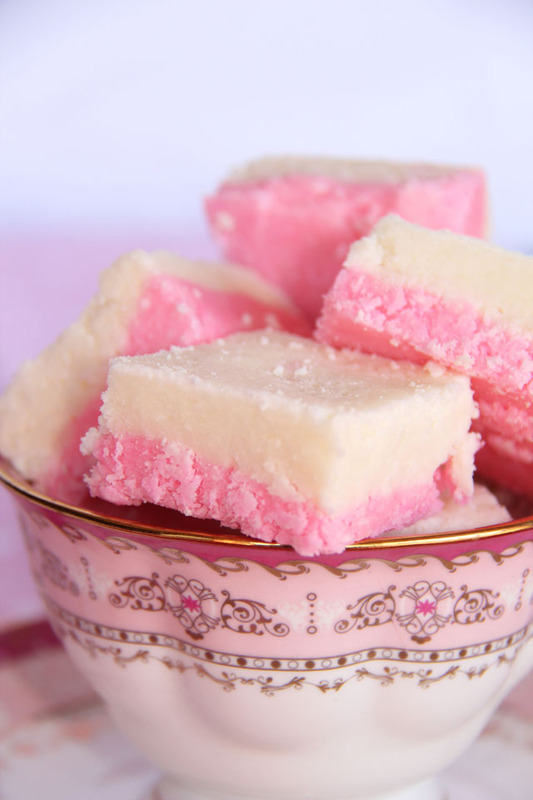 Coconut ice with condensed milk is a delicious (and safe) sweet treat kids will love to make. It does not include boiling sugar syrups, hot ovens or sharp knives. 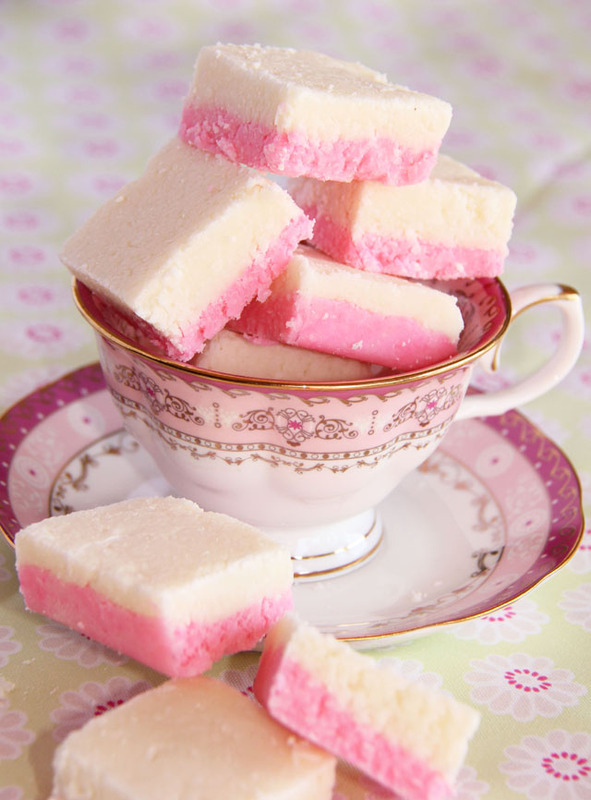 And the super sweet, pink-and-white squares bring back memories of Ferris wheels, school fêtes and church bazaars to the young and old. With the school holidays in full swing, many households have their fair share of bored “little people”. And ours is no exception. Most kids love an opportunity to experiment in the kitchen. And it sure is a winning recipe to keep them occupied for a while! So I ordered a batch of this coconut ice, made with condensed milk, from the two budding Masterchefs in our house. Rub a little butter over the inside of a 20cm x 20cm x 4cm deep cake tin. Then line the tin and the sides with baking paper. In a large bowl, mix the icing sugar and coconut. Add in the condensed milk, lemon juice and rosewater and mix really well. If it’s too sticky, add some more coconut or icing sugar. Spoon half of the mixture into the square cake tin. Flatten it by pressing down with damp fingers. Add a few drops of pink food colouring to the mixture left in the bowl and mix evenly. Spoon the coloured mixture over the top of the white layer and use damp fingers to press it evenly. Smooth down with the back of a wet spoon. Loosely cover and leave in the fridge overnight to set and dry out. 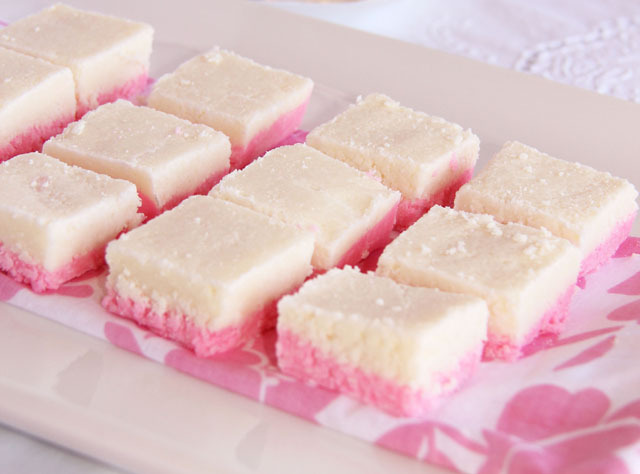 Use the baking paper to lift the coconut ice from the tin. 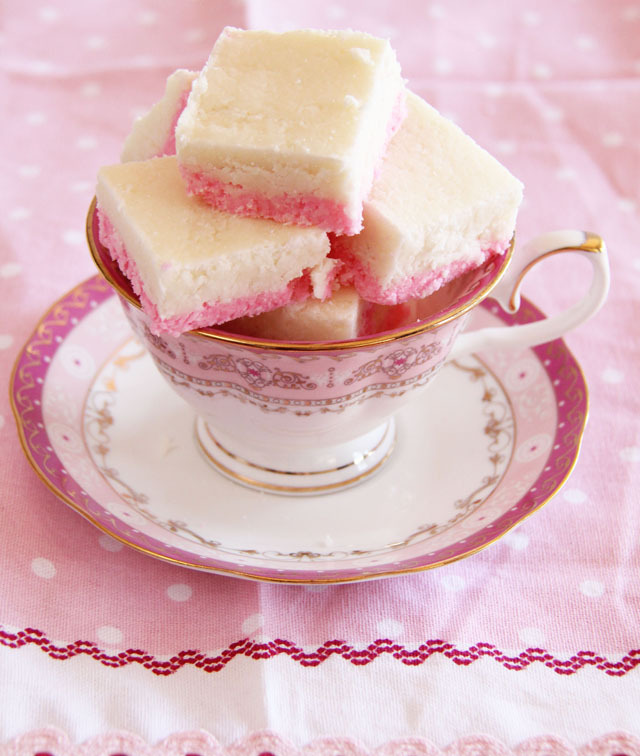 Cut into 4c x 4cm squares and serve. So when the “little people” in your house, get into each other’s (and your) hair, march them to the kitchen, armed with a can of condensed milk! !